Peter Koehler - Why Meditate? "Now obviously if I talk all the time, I don’t hear what anyone else has to say. And so in exactly the same way if I think all the time - that is to say if I talk to myself all the time - I don’t have anything to think about except thoughts. And therefore I’m living entirely in the world of symbols, and I’m never in relationship with reality. Alright, now that's the first basic reason for meditation. But there is another sense, and this is going to be little bit more difficult to understand, why we could say that meditation doesn’t have a reason, or doesn’t have a purpose. And in this respect, it’s almost unlike all other things that we do, except perhaps making music and dancing. Because, when we make music, we don’t do it in order to reach a certain point, such as the end of a composition. If that were the purpose of music, to get to the end of the piece, then obviously the fastest players would be the best. And so likewise, when we are dancing, we are not aiming to arrive at a particular place on the floor, as we would be if we were taking a journey. When we dance, the journey itself is the point. When we play music, the playing itself is the point. And exactly the same thing is true in meditation. Meditation is the discovery that the point of life is always arrived at in the immediate moment. And, therefore, if you meditate for an ulterior motive – that is to say, to improve your mind, to improve your character, to be more efficient in life – you’ve got your eye on the future and you are not meditating. Because, the future is a concept; it doesn’t exist. As the proverb says, “Tomorrow never comes.” There is no such thing as tomorrow; there never will be, because time is always now. That’s one of the things we discover when we stop talking to ourselves and stop thinking: we find there is only a present – only an eternal now. It’s funny then, isn’t it, that one meditates for no reason at all, except we could say, ‘for the enjoyment of it? And here I would interpose the essential principle that meditation is supposed to be fun. It’s not something you do as a grim duty. The trouble with religion as we know it, is that it is so mixed up with grim duties, ‘we do it because it’s good for you, it’s a form of self-punishment’. Well, meditation when correctly done has nothing to do with all that. It’s a kind of digging in the present; it’s a kind of grooving with the eternal now. And it brings us into a state of peace where we can understand that the point of life, the place where it’s at, is simply here and now. Here's to grooving with the eternal now. 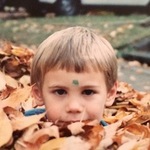 Oak - A new meditation app by Kevin Rose I've been using (and enjoying). One section of the app has a "Wisdom" section with recordings you can listen to, which is where I stumbled across this. 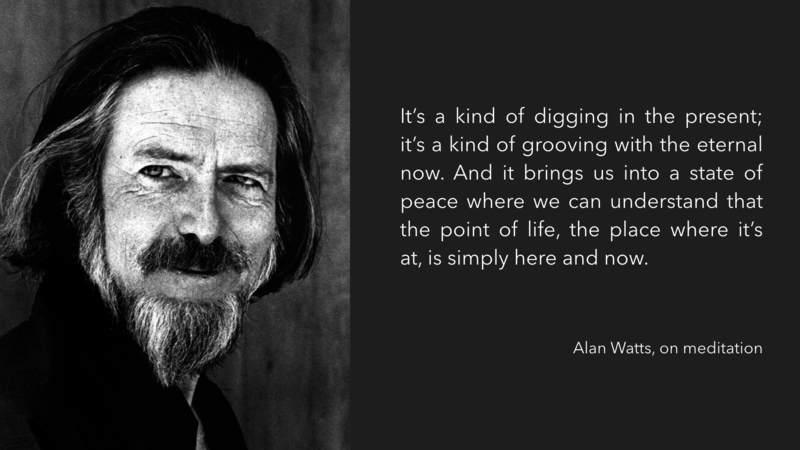 The Alan Watts Organization - You can buy more of his recordings at their website or you can find many of them on the Alan Watts Podcast. Subscribe today to receive my longer posts via email. I also occasionally send out recap emails with links to my shorter posts (like this one) so you never have to worry about checking the blog.